As any resident of the East End knows there is a lot of development going on in the neighborhood. Schools, grocery store, apartments, houses are all part of a continuous revitalization (to some gentrification, but that’s another topic). One concern that we’ve discussed at length at CHPN are special use permits and their impact on parking, trash, and the look and feel of the neighborhood. How do we make sure and maintain the things that make the neighborhood special? A community in an urban setting that feels homey and welcoming but that still keeps its historic roots and architecture (while being affordable!). What is a Special Use Permit? It is a permit that allows a landowner to obtain or build in a tract of land that does not fall directly under the permitted usage of that zoned area. In Richmond, these SUPs are approved by City Council. SUPs usually need to be approached with caution and with more in mind than just profits. Therefore it’s encouraged for developers to have conversations with civic associations, property owners and residents. The Church Hill Central Civic Association is a good example of these conversations. They meet quarterly. SA Chaplin, one of our readers, wrote us recently about some of his concerns regarding a new development filing for an SUP on 31st and M St. You can find his remarks below along with the SUP application and map of the property. 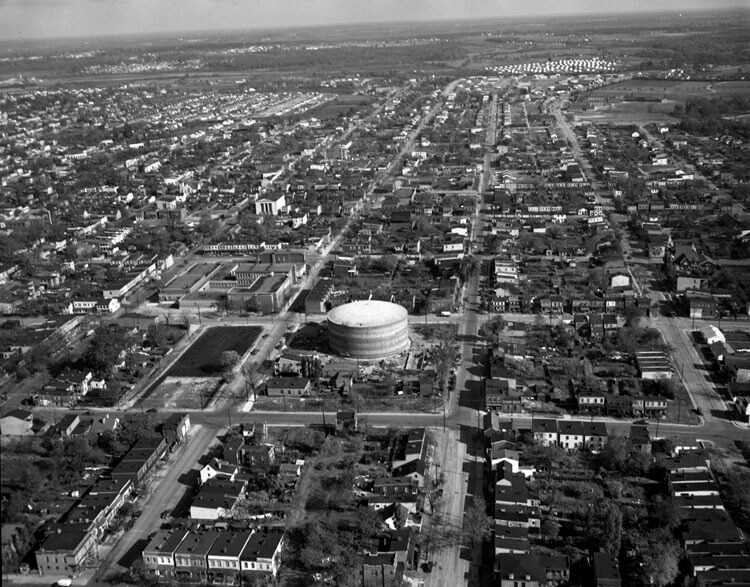 Currently 31st and M St is an empty lot close to CHAT and the water tower. The owner claims that the lot was originally going to be yet another apartment building. The plan is to build 6 houses. The lot would appear (because of its size and shape and because of the existing north-south alley) to naturally accommodate two houses (with modest size yards) facing N. 31st Street. Instead, the developer is proposing to construct six houses (with virtually no yards) which would face M Street. According to the request for a Special Use Permit (i.e., request for an exception to existing zoning and related requirements) each lot will be less than 75% of the legally required size. As to parking, if one assumes that each new house will need space for two cars, there would be an immediate parking shortage. (The application states the existence of at most 10 spaces.) More importantly, if this SUP sets a precedent for the remainder of the block, future development would result in severe parking issues. Per the plan submitted, rear yards are nonexistent and required corner lot yardage is nonexistent. Regarding trash cans and recycling cans, there is no alley for these. 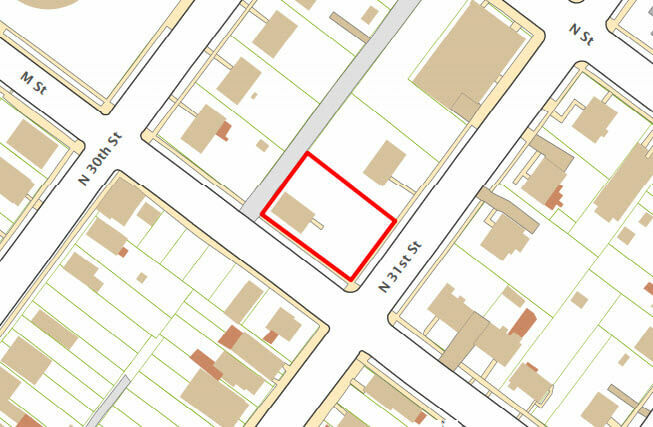 Approval of this SUP could set a precedent such that if each lot currently on this block was developed similarly there would be 34 or more houses on a block where there are now seven. The required lot size for a single-family dwelling is 2,200 sq. ft. These lots would clock in at approximately 1,647 sq. ft according to the SUP application. To meet the required lot size, without an SUP, the developer would need to construct 4 homes instead of the proposed six. The homes being proposed are a decent size at 1,768 sq. ft. This would be 3 attached pairs of homes. We here at CHPN don’t oppose or support this development. We’re presenting the facts. What we want to do is encourage everyone to be involved and make sure you’re aware of what’s happening in the places you live and work. In addition, we also encourage responsible development. You may or may not have an opinion, but at least you’re informed! Support or oppose we would encourage you to make your voice heard. To voice your opinion, you can go to the Planning Commission meeting on the 5th Floor Conference Room (City Hall) on Monday March 18th at 1:30 p.m. This area needs more density. Lot has plenty of room for 6 houses – before the redevelopment of this ShedTown area, I’m sure it accomodated something close to that. WOW Pass by this everyday. Cannot believe anyone would think 6 houses could fit there. Do they have eyes? Great project! Hope folks support this. It would be really unwise to oppose single family development because one had trouble with the lot size. This pattern of single family lot size is all over the neighborhood. a sup is a gift. creating affordable housing and replacement of public housing could have all been done by now if the city had gotten it in proffers for all of the sup and rezoning gifts given away to developers. Glad you showed the picture of the parking. It is like that for a couple blocks on M Street with only two houses on this block now. The 31st street side also us empty all the time also. There is plenty of parking available. This same business is trying to get approval of an SUP in Oakwood on the corner of 37th and R street. Sounds like the same plan – 6 very narrow 16′ houses in 3 pairs of attached houses. Several of us neighbors have raised objections because in our area, that is designated by the Master Plan of the city as low density, this does not fit the rest of Oakwood. I see this M street plan has no alleys behind the houses for trash and recycle containers. Why not stick to the zoning and do 4 houses? T.
I am currently renovating an approximately 1340 sq ft house that sits on a 700 sq ft lot. The house is half of a double, is about 17 ft wide on the interior, and all four sides of the house sit on the lot line. As long as houses like this have decent layouts and a footpath from the front to the rear or some sort of secondary access, they can be quite comfortable. I’ll reserve judgement until I’ve seen the actual plans for these things, but this sounds like fairly normal infill development for this area. Let me add: The historic home that I am renovating has a Floor area ratio of about 1.9. These homes would have a FAR of about 1.07. Historically, there appears to be a pattern in Church Hill of larger (and usually freestanding) homes (and commercial or mixed use buildings) sited on corners or facing the NUMBERED streets, with smaller, attached or more closely spaced homes facing the lettered streets and/or adjacent to the alleys. In a lot of cases, the smaller houses appear to have been built later in what was formerly the rear yard of a larger corner home/building. Perhaps they should build 1 or 2 doubles facing M Street (with more of a rowhouse configuration – long/narrow) and a larger double/duplex with more of a square/corner configuration fronting the corner of M and 31st. Perhaps the corner building could be taller to accommodate the same amount of interior space on less land. Not necessarily more historically accurate (maybe/not sure) – but might offer more options for side yards and open space. Looking at the Sanborn Maps from the early 1900s it appears that there were 6-7 homes on this particular site. Also the satellite map from the 1950s shows 6 on the site with a vacant corner. Putting 6 homes back where there were 6-7 homes at one time doesn’t seem too aggressive or out of place. Also when it comes to parking there isn’t a car in sight on the 3000 Block of M and half of the block is open on the 700 Block of N 31st ST. Whether its 6 cars or 15 it looks like there will be ample room to accommodate. Having more owners in the area is always a good thing vs more apartments. I think we can all agree with that!!! The same thing is being done on the corner of 37th and “R” Streets. The difference being the plan is to build several apartments. This neighborhood has only had single-family housing since before I moved in in 1957. Many of the neighbors were unaware of this plan. I live within 1/2 block of this proposed development and I am currently in opposition to this plan. I do not see the necessity of special use permit when the developer could just as easily place 4 homes (2 buildings) on the lot and be within the zoning ordinance guidelines. As SA Chaplin points out above, these homes will be 25% larger than what is allowed under the current zoning ordinance. 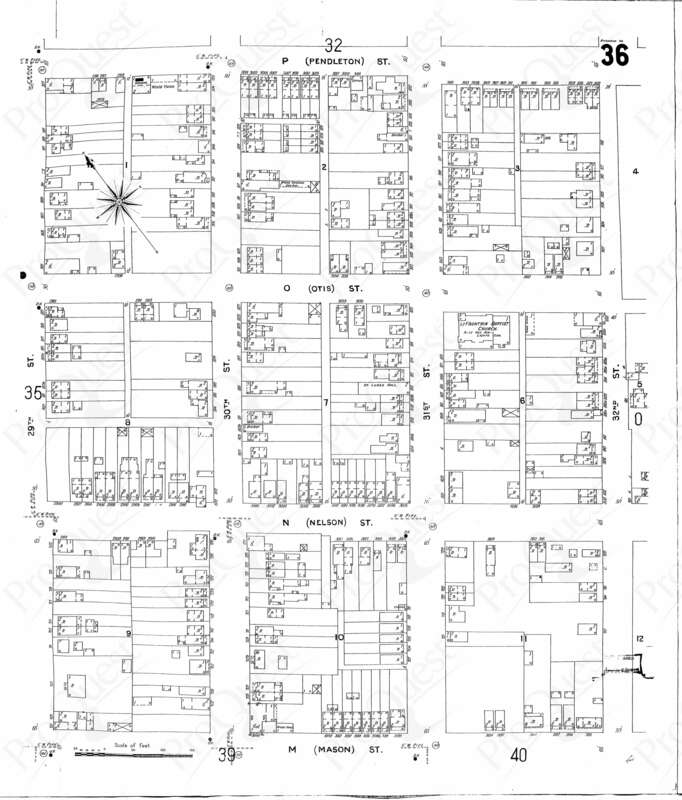 Yes – the old fire plan does show row-homes fronting M street – but those homes had SIGNIFICANT green space and yards in the rear. They were smaller rowhomes. In this plan, rear yards are nonexistent and required corner lot yardage is nonexistent. The effect will be tall square blocks that take up the entire corner, blocking out the sun, air, and eliminating green space from surrounding properties. The planning department has already determined at yesterday’s hearing to recommend approval of this Special Use Permit to the city council. There is one more chance to speak out in opposition to this plan on Monday 3.25 at 6pm at City Hall – at that point they will either pass or delay for 2 weeks while the developer is consulted. I am not opposed to homes being placed on this lot – but I’m opposed to the Special Use Permit which would allow the developers to break ordinance guidelines to increase profit margins.